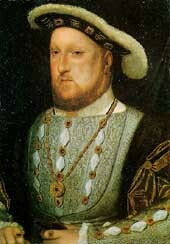 HENRY VIII (1491-1547), a king of England, greatly influenced English history by separating the Church of England from the Roman Catholic Church. Henry is often remembered for his pleasure-seeking life style, his cruelty, and his six wives. However, he was well-educated and a capable ruler. England's development into a leading world power. This reorganization included the establishment of a bureaucracy that took over many government duties from the royal household. Henry also involved England in several expensive wars with France and Scotland. Henry was born in Greenwich, near London. His father, Henry VII, was the first of the Tudor family of English rulers. 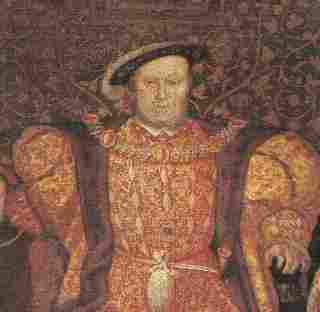 Henry VIII was 17 years old when he came to the throne in 1509. 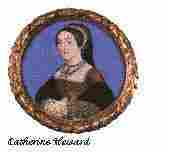 One of his first acts as king was to marry his brother's widow, Catherine of Aragon. 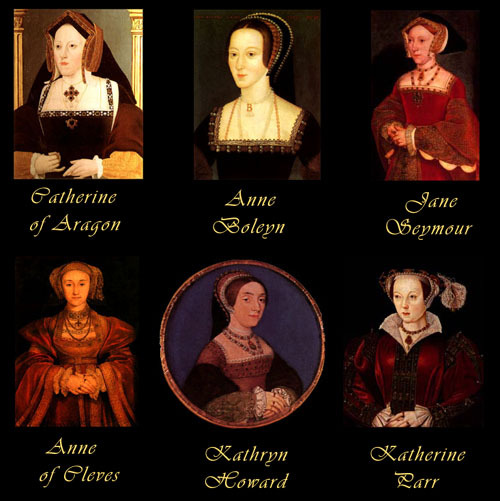 Catherine bore Henry six children, but only one lived--a daughter who later reigned as Mary I.
Henry wanted a male heir in order to help ensure that the Tudor family would continue to control the throne and to prevent any fighting over who would succeed him. He turned his attentions to a maid of honor at court, Anne Boleyn. Thomas Cardinal Wolsey, Henry's chief minister, asked Pope Clement VII to annul (cancel) the king's marriage. But Wolsey could not get the pope to do so, and Henry dismissed Wolsey in 1529. The king then denied that the pope had authority over England. He secretly married Anne Boleyn in January 1533.In March of that year, Parliament passed the Act in Restraint of Appeals, which declared that England was independent of all foreign authorities, including the pope, and that the king was England's highest judicial authority. On the basis of that act, a church commission headed by the Archbishop of Canterbury, Thomas Cranmer, declared the marriage of Henry and Catherine to be without legal force. In June 1533, Anne was crowned queen. At Henry's insistence, Parliament passed additional acts that completed the English church's break with the Roman Catholic Church. In 1534, the Act of Supremacy recognized the Church of England as a separate institution and the king as its supreme head. In the years that followed, Henry dissolved the monasteries in England, primarily to obtain their wealth. The annulment did not produce a stable married life for Henry. 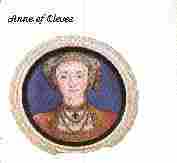 In 1533, Anne bore him a daughter who later reigned as Elizabeth I. Then in 1536, the king had Anne beheaded on a charge of adultery. 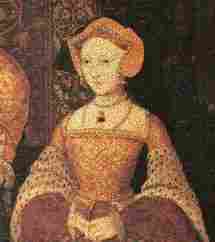 Henry's third wife, Jane Seymour, died shortly after the birth of a son who later ruled as King Edward VI. At the urging of his chief minister, Thomas Cromwell, Henry married a German princess, Anne of Cleves. But Cromwell was disgraced and executed, and Henry had his marriage to Anne annulled. 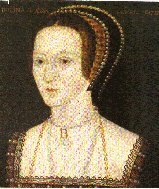 The king then married Catherine Howard, who, in 1542, was convicted of adultery and executed. 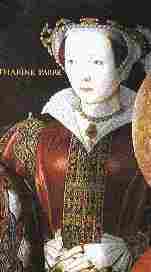 Henry's sixth and last wife, Catherine Parr, outlived him. Update: from Queen's Official Web Site 8/10/97. 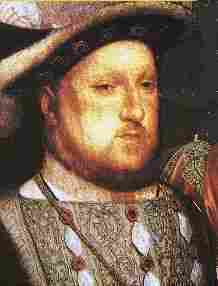 Henry VIII (reigned 1509-47) was 17 when he became king. His first wife, Catherine of Aragon, provided him with a daughter, Mary, but no male heir. In order to divorce her, he broke with the Roman Catholic Church and declared himself Supreme Head of the Church of England. Five subsequent marriages produced two children, Elizabeth and Edward. The break with Rome led to the Dissolution of the Monasteries (in which monastic lands and buildings were sold or disposed of, and the monks disbanded or imprisoned) and the beginnings of the English Reformation. Henry's involvement in European politics brought him into conflict with the Scots who were defeated at Solway Moss in 1542 (the Scots had been defeated before at the battle of Flodden in 1516). Control of Wales was strengthened by the Acts of Union of 1536 and 1542 which united England and Wales administratively and legally, and gave Wales representation in Parliament. Henry died in 1547 leaving his sickly, 10-year-old son to inherit the throne as Edward VI (reigned 1547-53). More information on Henry VIIIErasmus, Anne Boleyn and the Death of WolseyIn Cambridge a monk named Erasmus was at work on a new version of the New Testament, Novum Instrumentum. He published tracts against the superstitions of Catholicism and thus the Pope. He won respect and reform from the new scholars of England, among them Thomas More and John Colet. Henry VIII, meanwhile, was desperate for a male heir, Catherine of Aragon had given him a daughter, Mary. He set out to annul his marriage but insisted that the Pope should acknowledge his marriage as a Papal mistake. This led in the end to his falling out of favour with the Pope and to the dissolution of the monasteries. Wolsey's failure to negotiate the annulment with the Pope led to his downfall. He was stripped of many of his possessions and sent north to his archbishopric at York. He died on the way. In 1527 he fell madly in love with Anne Boleyn. He finally married her in 1533. She also gave birth to a daughter, Elizabeth, but the King was happy until she gave birth to a stillborn baby in 1536. Henry found a new love in Jane Seymour and was easily convinced by Thomas Cromwell that Anne was having an affair. She was beheaded in 1536. Henry VIII was deeply religious and earned from the Pope the title Defender of the Faith in 1521. In 1509 Henry VIII came to the throne and immediately, on the advice of his councillors, negotiated to marry Catherine of Aragon. He distrusted the hereditary nobility choosing men of low birth as his advisers. He made Thomas Wolsey his Lord Chancellor and Chief Councillor in 1515. Wolsey's rise through the Church was rapid - Bishop of Lincoln, Archbishop of York, Cardinal, Papal Legate - the latter made him above all ecclesiastical authority in the land. Wolsey ruled, in the King's name, for 14 years. He favoured the Star Chamber and used it for ministerial judgements. These were fair but often ruthless. Henry VIII was ambitious he looked towards Europe. In 1512 he hired Austrian mercenaries and defeated the French in the Battle of the Spurs in 1513. In the same year at home the Earl of Surrey won a bloody victory against the Scots at Flodden killing James IV. The one-year-old James V came to the throne of Scotland and his mother, Margaret - Henry's sister, became Regent. The son of an Ipswich butcher Became an Oxford don then royal chaplain in 1507 In 1511 Wolsey became a royal councillor and four years later a cardinal and then Lord Chancellor Dominated Government, restructured the equity and prerogative courts, and was hated by the aristocracy Failed to secure annulment of Henry VIII's marriage to Catherine of Aragon and the King was displeased In 1529 Wolsey was dismissed, stripped of many of his possessions and sent north to his archdiocese in York He died on the way. Thomas Wolsey was the son of a poor, rascally butcher of Ipswich whose name appears on the borough's records for selling meat unfit for human consumption. Henry is at his palace at Richmond on the bank of the Thames, and a barge covered in silks and tapestry has been sent for Pasqualigo and his entourage. This vessel conveyed us to the said palace of Richmond, where they led us into a sort of hall, and though it was before mass, they made us breakfast, for fear we should faint; after which we were conducted to the presence, through sundry chambers all hung with most beautiful tapestry, figured in gold and silver, and in silk, passing down the ranks of the body-guard, which consists of three hundred halberdiers in silver breast-plates and pikes in their hands; and, by God, they were all as big as giants . . . We at length reached the King, who was under a canopy of cloth of gold, embroidered in Florence, the most costly thing I have ever witnessed. He was leaning against his gilt throne, on which there was a large gold brocade cushion, where the long gold sword of state lay. He wore a cap of crimson velvet, in the French fashion, and the brim was looped up all around with lacets, which had gold enamelled tags. His doublet was in the Swiss fashion, striped alternately with white and crimson satin, and his hose were scarlet and slashed from the knee upwards. Very close round his neck he had a gold collar, from which there hung a round cut diamond, the size of the largest walnut I ever saw, and to this was suspended a most beautiful and very large round pearl. His mantle was of purple velvet, lined with white satin, the sleeves being open, and with a train verily more than four Venetian yards in length. This mantle was girt in front like a gown, with a thick gold cord, from which there hung large glands entirely of gold, like those suspended from the cardinals' hats; over his mantle was a very handsome gold collar, with a pendant St George, entirely of diamonds. On his left shoulder was the garter, which is a cincture buckled circular-wise, and bearing in its centre a cross gules on a field argent; and on his right shoulder was a hood, with a border entirely of crimson velvet. Beneath the mantle he had a pouch of cloth of gold, which covered a dagger and his fingers were one mass of jeweled rings. In 1542 the English invaded Scotland only to have to turn back. The Scots proceeded into England to be defeated at Solway Moss - the news killed James V leaving as his heir Mary Queen of Scots who was one week old. At once both the English and the French tried to negotiate marriage agreements with the Scots this led to yet another English/French conflict. This led to the Scots and the French re-establishing the Auld Alliance which had united them against England, on and off, since 1295. Henry VIII died in 1547, he had been ill for a long time. England needed a strong heir but Edward VI did not fulfil this hope. He came to the throne at the age of 10. Edward Seymour, Duke of Somerset, became his Protector. Hans Holbein painted at the Court of Henry VIII and many of the images we have of this King were Holbein's work. The decline of the Welsh language started in 1543. In 1536 Catherine of Aragon died, Anne Boleyn was beheaded, Henry VIII married Jane Seymour, Wales lost its independency, the Privy Council was established and Parliament agreed the Act against the Pope's authority which makes the monarch the head of the English church. Thomas More and John Fisher lost the King's favour by refusing to swear to the supremacy of the King. Thomas Cromwell who became chief councillor on the demise of Thomas Wolsey swore the King's supremacy and kept his position. He reformed Government policy creating Government departments including the Privy Council He did not fall from power until 1540. Henry's treasury needed replenishing - he looked to the church, namely the monasteries. The dissolution of the monasteries began. Dissolution of the Monasteries - Some possible questions & answers on this subject. Little Jack Horner was a real person and the plum was the manor of Mells in Somerset. Jack Horner was the steward to the abbot of Glastonbury. By a clever political trick, during the general land grabbing of the Dissolution, Jack Horner got the deeds to the manor of Mells in Somerset . He then gave them to Henry, who was so pleased, that he gave Horner the manor. Amateur genealogists will be amused to trace his family line to the Bonham-Carters, some of whom have became as famous as the good little boy himself.